In general, stockbrokers don’t allow investors to buy stocks with their credit cards. You may be thinking, “Why not? I’m not flush with cash, and my credit card has cash back.” Your argument is valid, but you haven’t considered the interest credit card companies charge, and the value of your returns. Credit cards typically charge 18% interest, and it’s quite rare to earn that percentage on a return. By purchasing with your credit card, you’re overpaying for your stocks, and the return wouldn’t be anywhere near what you paid, and as such, you’ve cost yourself more than you’ve earned. Does that mean stocks can’t ever be purchased with a credit card and also be worthwhile? Short answer: no! You can purchase stocks using your credit card, but you’ll need to be creative to make it worth your while. The following are a few ways to use your credit card to garner stocks, without overpaying after interest fees are attached. If you absolutely must use your credit card to begin investing, the following strategies will help you do so, and also help you avoid the more garish fees associated with paying for your investments with a credit card. Keep in mind: most stockbrokers have rules against purchasing stocks with a credit card because they don’t want buyers to invest money they can’t afford to pay back. The easiest way, but not the most financially advisable way, is to take out a cash advance on your credit card. You can avoid all of the hassles associated with credit card purchases through a stockbroker because your stockbroker will be receiving cash or a check, and will not know you withdrew from your credit card. eHow offers a handy guide on buying stocks with cash withdrawn from your credit card, and you can use this guide if you choose to follow this method. So, how can you avoid this pitfall when there’s no real way to avoid interest on credit card purchases? 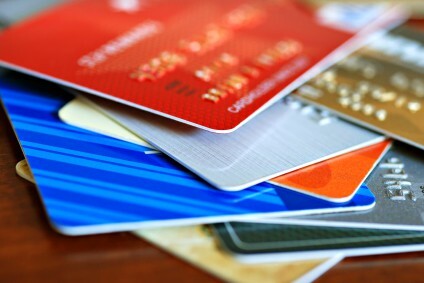 The truth is, there is a way to avoid interest on credit card purchases. If you spend on a credit card, and then move that debt to a 0% balance transfer card, you’re eliminating the interest! It’s simple enough, but you’ll need to be approved for a balance transfer card in order for this method to work. You can be debt free faster with a 0% balance transfer CC, and you’re eliminating the extraneous fees associated with interest. Therefore, if your stock goes down in value, you’re only using your initial investment, you’re not losing your investment, plus fees, and plus interest. Some stockbrokers are beginning to offer cheaper stocks for purchase with a credit card. These stocks typically cost $50 or less, and you can purchase them with a credit card. Again – all of the same warnings apply. You could end up overpaying due to the stock going down in value, and credit card interest rates not changing. Finally, a margin account is a form of credit offered by a stockbroker. It’s not actually a credit card, but it is a form of credit extended to buy stocks. Talk to your broker to see if they extend margin accounts to credit worthy clients, and you could open a margin account. None of this applies if you never carry balances on your credit cards in the first place. Picture someone who has $15,000 in the bank, and wants to invest $2,000 (Money they’re willing to risk in the market). If you earn 2% cash back for every transaction on your credit card, then that’s an automatic $40 earned on your investment. Then, since you have money in the bank, it doesn’t matter if the investment goes up or down in the market – you’re still going to pay off that credit card at the end of the month; Therefore, you won’t pay a dime in interest. I think the real reason that brokerage services won’t let you invest with credit cards is because they would be charged a transaction fee for accepting your credit card – this would then have to be factored into their own fees. Why can’t we use Debit Visa and MasterCards to buy Stocks? It is my own money and I want to use them for Frequent Flyer Points. I never carry a balance. This article is mostly irrelevant for those who pay their cards on time monthly. I think the bigger issue is not wanting to have the issue of dealing with a $1000+ chargeback from a credit card transaction. The funny part is you can buy ANY liability you can imagine with a credit card and there’s no problem there whatsoever. Isn’t it interesting you can’t buy an ASSET (stocks) with that same credit card? I’m into stocks and it’s frustrating that when I transfer from my checking account to my broker outfit, it takes 4 days for my funds to clear, which can mean missing out on a great opportunity. Looking for a way around this. My bank is no help. Wish that Zelle worked with brokers also. Mistake #1 is thinking it’s your own money. If it’s in a bank it’s not your money! Your merely an unsecured creditor! If you want “your own” money, you need to get gold or bitcoin! You can get rid of this problem by opening an account with Robinhood. As long as you have the money in your bank account you can set up a transfer request and the money will be available to trade in just seconds.